In order to fully enjoy an immersive experience in Bayfield County, hop on a boat that will take you to top attractions such as the Apostle Islands National Lakeshore Mainland Sea Caves, the shipwrecks of Lake Superior, and the lake itself. For boating buffs that want to delve deeper into maritime history or do a bit of treasure hunting, book a tour on the premier Apostle Islands Cruise Service. The Wrecks, Rocks & Lighthouses Tour has you aboard a glass-bottom boat for easier viewing of the lake’s well-known shipwrecks in all their rusting glory. You will also have the pleasure of passing by lighthouses and Basswood Islands’ Honeymoon Rock. The fares are $37-$60 dollars for adult passengers, $20-$33 for children from 6-12 years old, and $1 for children below 6 years old. Each boat also features a snack bar and restroom for your convenience. 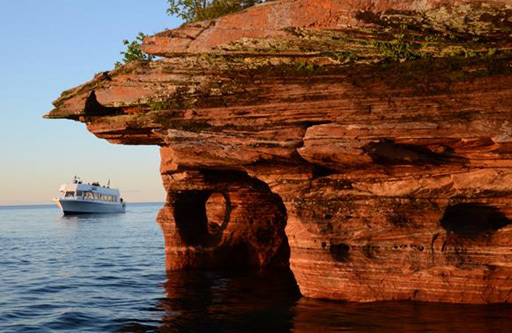 Look into the variety of Grand Tours offered by Apostle Islands Cruise Service. The narrated scenic tours cover 55 miles and last from 2.5 to 3.5 hours. You’ll cruise past sea caves, historic lighthouses, breathtaking scenery, and stunning rock formations. You can reserve your tickets online or call 800-323-7619. Visit their office at 2 North Front Street, Bayfield WI. The ferry provides a quick 25-minute trip from LaPointe to Bayfield while giving you Instagrammable views of Lake Superior and the Apostle Islands. You can also bring your bike or car along. Madeline Island happens to be the largest of the Apostle Islands and is rich in culture and history, being the home of the Ojibwe people hundreds of years ago. The current round-trip rates start at $7 for children 11 years old and below and $14 for those 12 years old and up. Cargo trailers are charged $36 while rates for bicycles go for as low as $7. If your priority is to quickly get from one place to another while taking a few snaps along the way, then this is the tour for you. To book a ride, contact them online or call 715-747-2051. You can also drop by Bayfield Terminal, 20 Washington Avenue Bayfield, WI. Explore what the Apostle Islands have to offer via Good Earth’s tour packages. The Mainland Sea Caves Powerboat Tour goes straight to the caves, while the Island Adventure Tour is recommended for those who want to go island hopping. The Private Sunset Tour, on the other hand, is designed for couples who don’t fancy crowds and are ready for a romantic evening. The duration of the tours ranges from 90 minutes to 4 hours, depending on the package selected. Tour rates are from $60-$120 per person. The Gift Shop also sells kayaking supplies for boating aficionados plus artisan jewelry and Minnetonka moccasins if you want to bring home souvenirs. For bookings, you may reserve a slot online or call 715-742-3910. You can also visit them at 22670 Siskiwit Bay Parkway, Cornucopia WI. If you’re looking for a home in the Bayfield and South Shore areas of Wisconsin, explore the website to check out your options. For inquiries, call Windseeker Realty LLC at (715)779-5000 or email Agent(at)WindseekerRealty(dotted)com.